100% cotton pretreated fabric for a vibrant print and crispness wash at 30c maximum temperature. 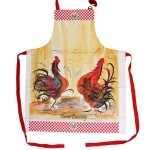 Apron has the fun lively Come Dancing design in reds. 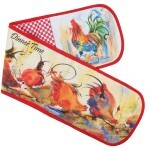 Oven Gloves has Dinner Time design with Bad Feather Day and Percival on the pads. 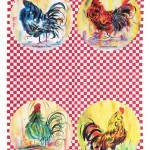 Tea Towel features Wicked Hen, His Majesty, Feathers in a Twist and Clowning Around with a red and white check surrounding the edges. 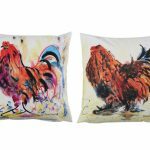 Cushion features Supremo a proud cockerel in golds, deep reds and old ochre on one side and Claudius the other side with blues oranges and magenta. The cushion cover takes an 18″/46 cm. The feather pad which is not supplied.